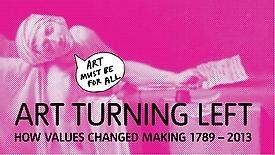 Left-wing political values such as collectivism, equality and the search for alternative economies have continuously influenced the making of art and visual culture, from the way in which William Morris organised his production line to the deliberate anonymity of the designers of the Atelier Populaire posters in Paris 1968. The direct involvement of visual artists in politics and the social and ethical values of left-wing politics can be traced to the French Revolution, when artists such as Jacques-Louis David granted permission for their artwork to be reproduced to support the Republican cause. Versions of David’s iconic image of The Death of Marat 1793–4, one of the most famous images of the Revolution is an exhibition highlight. Art Turning Left is a thematic exhibition, based on key concerns that span different historical periods and geographic locations. They range from equality in production and collective authorship to the question of how to merge art and life. The exhibition moves away from the political messages behind the works and claims about the ability of art to deliver political and social change, and instead focuses on the effect political values have had on the processes, aesthetics and display of artworks. 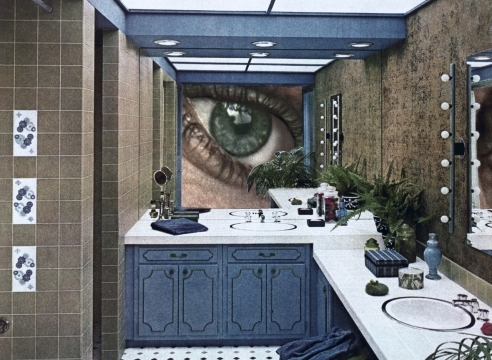 The exhibition includes artists from across the globe including Martha Rosler, Marianne Brandt, Jeremy Deller and Alan Kane, The Hackney Flashers, David Medalla and Tim Rollins, and also examples of research from the Mass Observation Movement. Programmed in parallel with Art Turning Left, Tate Liverpool also presents a display of archival material from Palle Nielsen’s social experiment The Model - A Model for a Qualitative Society 1968. The Danish artist converted the Moderna Museet in Stockholm into an adventure playground in order to observe children and present viewers with the opportunity to visualise a more equal society. The display is the most comprehensive collection of material from the project including sound, documents and photographs.